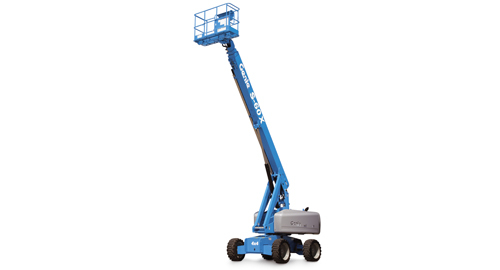 66 Foot Straight Mast Boom Rental – Genie S-60, is available for rent in Rochester NY, Ithaca NY and the entire Western New York region from the Duke Company. The Genie S-60 capabilities include positive traction drive which maintains equal power to all drive wheels and 360 degree continuous rotation turntable for quick positioning. Platform rotation = 160 degrees. Vertical jib rotation = 135 degrees. Turntable tailswing = 4 feet. Drive speed – raised or extended = .68 MPH. Gradeability – 4 wheel drive – stowed = 45%.